I found myself inadvertently catching the Outer Link bus from Pt Chevalier to Balmoral (the southern part of the route) and then the next day from Balmoral to the CBD. It's a brand new line with brand new buses so I was glad to try it out. There was no waiting time at the Pt Chev bus stop, the bus had arrived there before I did, so all good. The frequency stated by Maxx is about every 15mins, which I guess in Auckland's bus system is not bad at all - especially on the weekend. It chugged along happily but at frequent intervals there was an announcement that the bus may be waiting a few minutes at some bus stops to prevent it getting too much out of whack with its timetable. This makes for a very slow frustrating progress. It took about 40mins to get from Pt Chev to Balmoral and about 30mins to get to downtown. 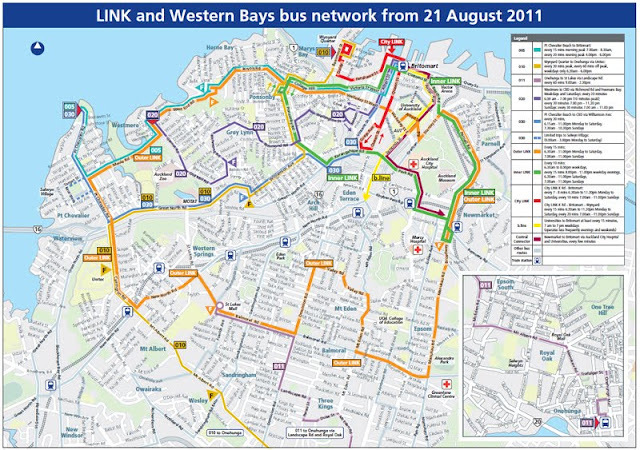 If you're in Balmoral, it may be faster to catch a Mt Eden bus route. As you can see in the route diagram, there are some curious "kinks" in the route, i.e. where deviations into side streets happen instead of going straight through. Why there is this lengthy detour through Mt Eden to end up again on Balmoral Road is a mystery to me. Hardly anyone got off or on in that deviation, and it just added to the travel time. Being a Saturday, I thought it was very well patronised, and best of all, it's free for Waiheke Fullers monthly pass holders (as are the other Link services).